CREW MEMORIAL - LT EUGENE M. THOMAS JR. 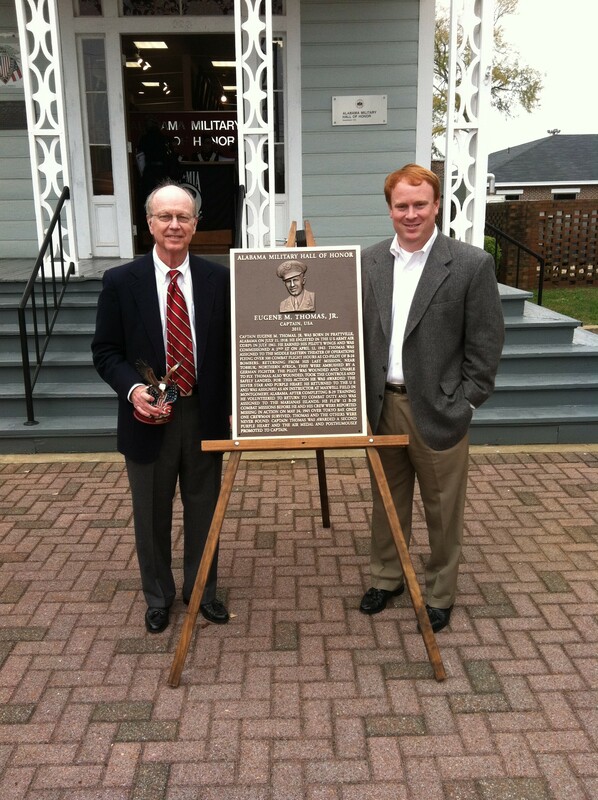 I have some exciting news-my father will be inducted into the Alabama Hall of Heroes in Marion, Alabama, in October. The family is thrilled and honored and I knew you would want to know a Z Square 7 crew member is being honored in this way. I had to put together a fairly detailed application and the information in your book was invaluable. I do not think I could have gotten it all together without it. So, thank you again for all the time and energy you put into writing that special account & remembering my father and the other crew members who were all heroes, too. I'll keep you posted as I get more information about the ceremony, etc. It was great, pretty impressive tribute…..check the Montgomery, Ala., Advertiser online for an article about it and photo. The columnist is Al Benn. More later. I’ll send you a photo of myself and son by the plaque. I could not have done it without your very hard work on Z Square 7. Thank you so much once again. Established on Jan. 23, 1975 by Governor George C. Wallace's executive order number 59, the Hall of Honor was created as a means to honor Alabama's military heroes and to provide a permanent and visible tribute to them. 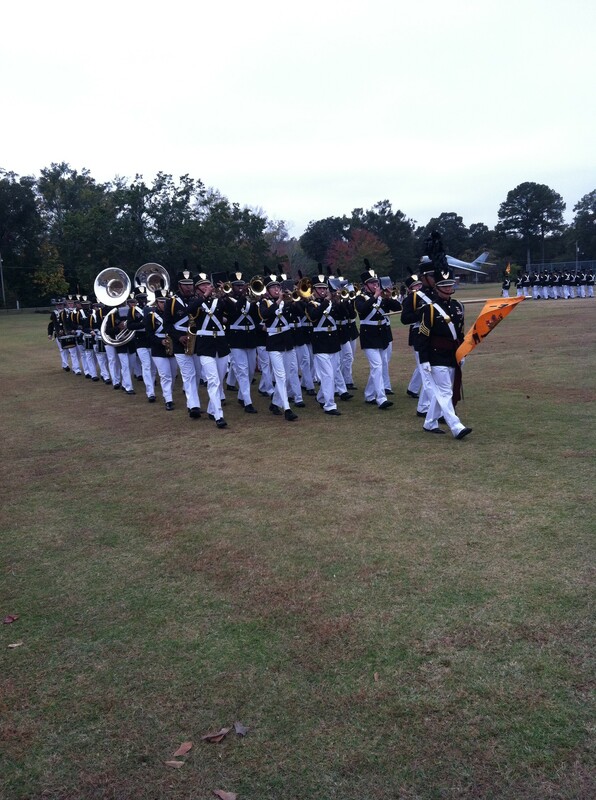 The order specified that the location was to be at Marion Military Institute (MMI) in Marion, Alabama. It was subsequently re-established by executive order number 42, dated May 2, 1991, as amended on May 24, 1991. In order to provide an appropriate location and a suitable facility for the Hall of Honor, MMI provided the use of their "old City Hall building" located on campus. The state of Alabama provided funds to remodel the building. Inductees are honored with a 20" x 30" bronze bas-relief plaque and other personal items. The museum also displays a variety of associated memorabilia including weapons, uniforms and pictures. After the induction in April 1977, the Hall of Honor was inactive, mainly due to participation and funding. During that period, renovation of the building was finished. 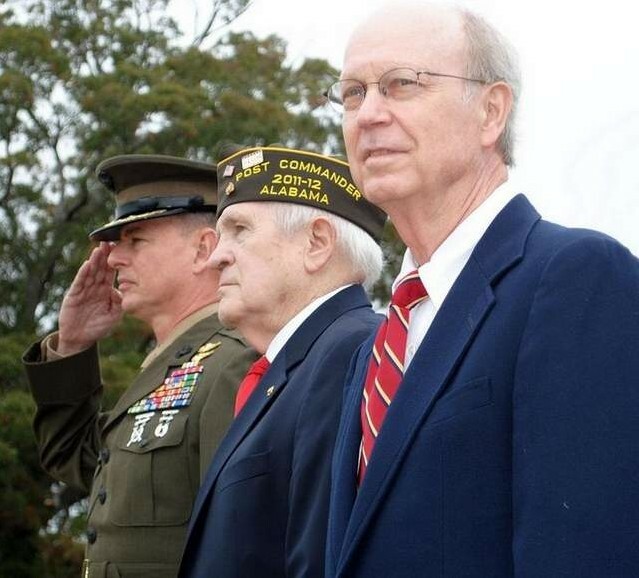 On April 7, 1989, the Alabama Military Hall of Honor museum was re-dedicated in ceremonies which featured Mr. Robin Swift, state Director of Finance, representing Governor Guy Hunt. The nomination, selection, and induction process once again became inactive after the 1990 induction until 1999 due to participation and lack of funds. A budget has been developed and efforts are underway to obtain funding from the Alabama Legislature. Plans are also being discussed for enlarging the museum facility. A "Friends" organization has been established whose purpose is to assist the Alabama Military Hall of Honor in fundraising and other efforts to recognize and honor outstanding Alabamians who have distinguished themselves in the Armed Forces of the United States. As such, it will serve as a constant testimony to present and future generations that patriotism and heroism are not forgotten, but ever serve as a challenge for those who are yet to come. Marion Military Institute President David Mollahan, left, salutes the color guard as it passes Friday. 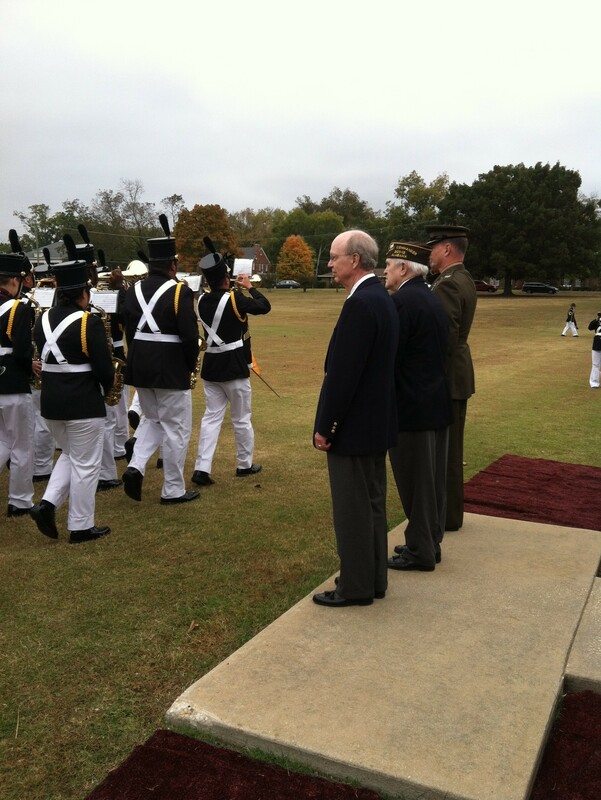 James Walter, center, and Marvin Thomas helped induct two heroes into the Alabama Military Hall of Honor in Marion. MARION -- Osmond "Kelly" Ingram and Eugene Thomas Jr. -- heroes who died in combat during two world wars -- were inducted into the Alabama Military Hall of Honor on Friday. Ingram received the Medal of Honor for heroism Oct. 15, 1917, when he attempted to jettison depth charges aboard the U.S.S. Cassin during a search for a German submarine. He was able to throw several overboard, but others exploded before he could dump them into the Atlantic Ocean. His effort helped save his ship, and he was posthumously awarded the nation's highest military honor. Thomas died May 24, 1945, when his B-29 bomber disappeared over Tokyo Bay during the waning days of World War II. The two were installed in the hall of honor on the campus of Marion Military Institute, where the Corps of Cadets marched in review on the parade ground and entertained friends and relatives of the inductees. Retired Navy Rear Adm. Timothy McGee referred to heroism during the induction ceremony that was moved inside to the MMI Chapel due to the threat of rain. "The brave have always defined what the rest of us wish to be, but bravery is misunderstood," McGee said. "It is not the absence of fear, but the will to overcome it." No one related to Ingram could be located, so James "Bucky" Walter, commander of the Kelly Ingram Veterans of Foreign Wars Post 668 in Birmingham, spoke in honor of him. Birmingham officials honored Ingram years ago, naming the city's most popular downtown park for him. "He was a common man who is finally getting recognition for what he did," Walter said. Marvin Thomas III, who was born one month after his father was killed, has sought through the years to obtain more information about his dad's death. "My mother said that the day I was born was the happiest day and the saddest day of her life," said Thomas, a history professor at Gordon College in Georgia. His father, a native of Prattville, was awarded the Silver Star for bravery in Europe before returning home to become a flight instructor at Maxwell Field in Montgomery. He later opted for duty in the Pacific as the war began to draw to an end. "He said his students were going to kill him so he might as well take a crack at the (Japanese)," said Thomas, who was joined by his wife, Denise, and several other family members during the program. Thomas said his father had flown 12 B-29 missions when his plane went down over Tokyo Bay. He said one of the crewmen survived, but the rest apparently were killed. 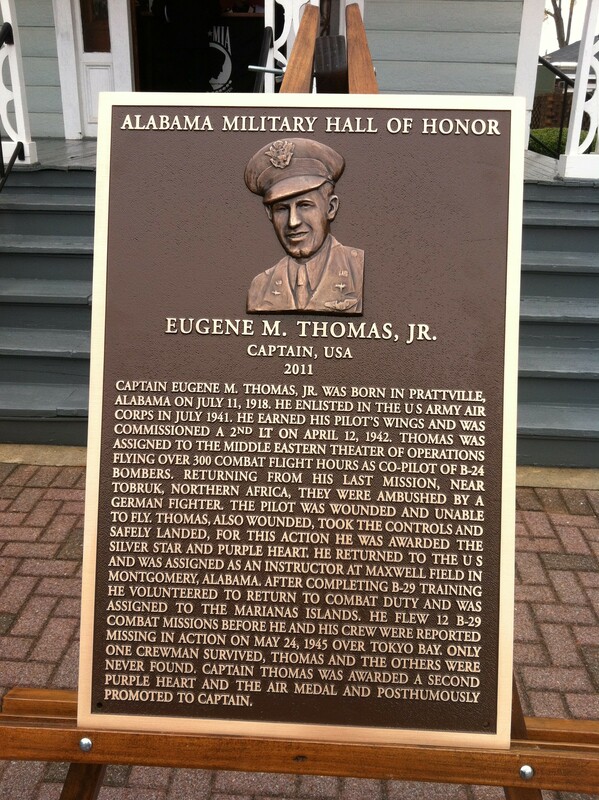 "Many pilots who survived but were captured when their planes went down were executed," said Thomas, who submitted his father's name for consideration as an inductee into the hall of honor. During his address at the chapel ceremony, McGee said awards and rewards were not in the minds of Ingram and Thomas the day they died. "They were thinking about their shipmates and squadron mates," said the retired admiral. "Each of these men had the complete trust of those they fought alongside." Alabama's Military Hall of Honor was established in 1975. Each year, military personnel who have distinguished themselves are eligible for induction. MMI, established in 1842, former home of Howard (Samford University) is anchor for the West Marion Historic District. Includes many historic buildings, including old City Hall which houses The Alabama Military Hall of Honor, honoring Alabama military heroes. Hours: MMI open daily except for holidays. Alabama Military Hall of Honor open by reservation.